Tucked safely away in a corner of our minds are memories ... vivid, sometimes even soulful memories of times past. At times they seem distant, as if scattered to the wind. But every now and again, they return to us. Something as simple as a familiar name or a photograph beckons them, and they march back in a parade of emotion. Some memories are simply too wonderful to keep all to ourselves. 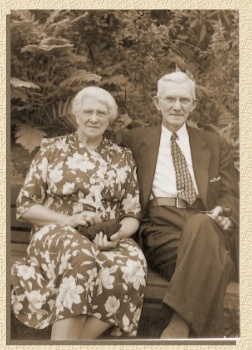 So here, penned by the daughters of Charles and Minnie Stoeckel, are a few very special ones of their "Uncle Fred" and "Aunt Lena" Moesel. Lena Christina Moesel (nee Stoeckel) was born 10 December 1882.
and passed away on the 4th of January 1944. The photograph at left was believed to have been taken July 15, 1940.